I love walking into the store in the middle of summer and seeing all of the beautiful and colorful summer squash varieties! This time of the year they are still tender and small, perfect for roasting...nice and sweet, not full of seeds like the large ones you get at the end of summer when they have overgrown. 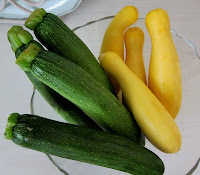 I can never pass up buying a few, since I don't have my own garden, and this time I got my hands on some very small zucchini and yellow squash. I wanted to make something for myself for dinner using them, and roasting them is one of my favorite ways in which they are prepared. Now, I could have gone for a simple side dish, but I decided to combine them with a bit of mushrooms and some truffle oil to make the whole thing a bit more interesting. I have never used truffle oil on summer squash before, but never a better time than now to try it! I wanted this to be a small plate sort of thing, and contain some protein as well, so I made a frico from a bit of pecorino romano and a poached egg and served it with the veggies to make the dish more substantial. As a whole the plated dish came together beautifully! 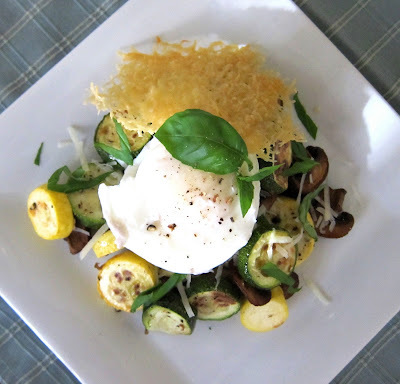 The flavors were wonderful...the sweetness of the roasted summer squash, earthyness of the truffle oil and saltiness of the pecorino along with the richness of the egg...party in my mouth! The best part? Didn't have to pay a large amount of money for it, and it was as good as something I would order as a small plate in a restaurant...maybe even better! Preheat the oven to 475 degrees, with rack set on the top level. To make frico, line a baking sheet with foil, and spray with a bit of non-stick spray. Drop the pecorino into a mound on the lined baking sheet, and bake until starting to brown, about 5-10 minutes depending on your oven. Remove from the oven, and let cool. Line another baking sheet with foil. Toss vegetables with truffle oil and spread out onto prepared sheet. Roast for about 15 minutes, or until starting to get nicely browned. When done roasting, sprinkle with a little sea salt and freshly ground pepper. Let cool slightly and toss with Tbsp pecorino and basil. To poach egg, heat water to a simmer in a medium saucepan with the vinegar and salt. Crack egg into a ramakin. Stir water with a spoon to swirl, and carefully pour egg into it. Let cook for 3-4 minutes or preferred doneness, and remove with a slotted spoon to a paper towel lined plate. Sprinkle a bit of sea salt and freshly ground pepper over egg. To plate, mound the veggies in the middle of the plate, and drizzle with a little truffle oil. Top with the poached egg and frico. Amy this looks so fancy! I'll definitely have to try making it. 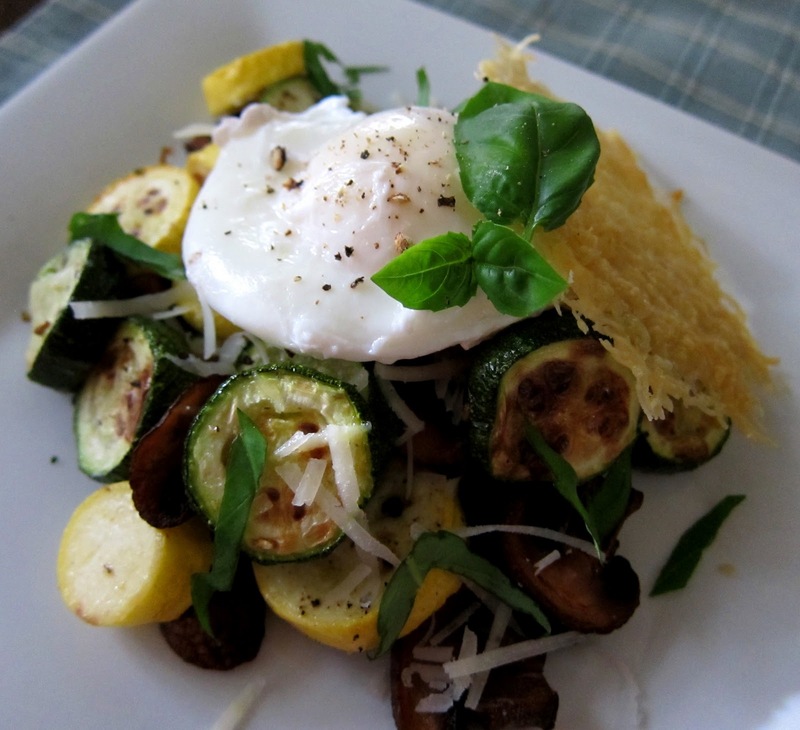 There's a guy at my farmers market who sells frico but i'd love to try making some myself. Is it hard? It looks like one of those things that seem really simple but are super easy to mess up. This looks fantastic! 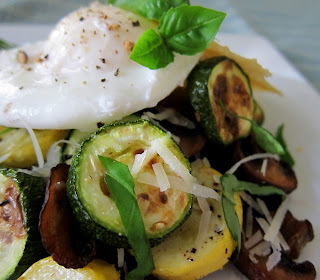 I have some squash and zucchini at home... I'm going to work on this :) Great job!